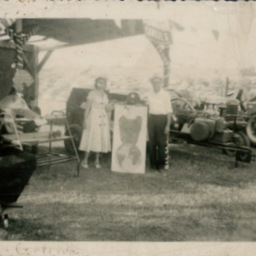 Photograph showing Fred Kibler and his wife Gertrude with the Woodstock Equipment Company, which he owned, at the Shenandoah County Fair, unknown date. 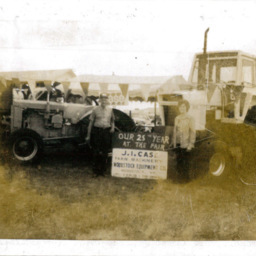 Photograph of Fred Kibler and his wife Gertrude Kibler with the Woodstock Equipment Company, which he owned, at the Shenandoah County Fair. 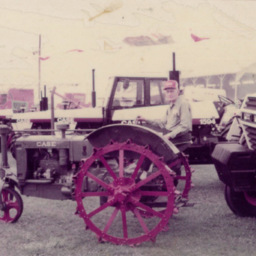 Fred Kibler aboard an antique case tractor at the Shenandoah County Fair, date unknown. 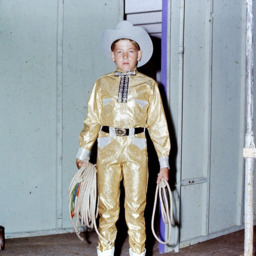 Photograph showing Terry Kibler preparing to perform at the 1970 4-H talent show held at the Shenandoah County Fair.